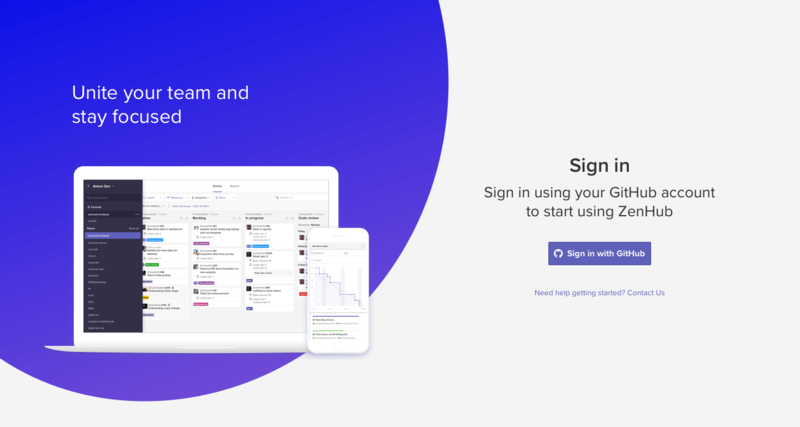 ZenHub unites your team within the GitHub interface with our extensions for Chrome and Firefox, while also integrating team members who need to track, manage, and report on projects but are looking to stay focused without the clutter of GitHub through app.zenhub.com. Send us an email with what team you're part of and we'll get you set up with the right URL for your team to access ZenHub on web and mobile. To get started, head to app.zenhub.com and sign in with your GitHub credentials. If you aren't currently using GitHub, you can sign up for an account here. Once signed in, you'll be prompt to select which Organization you'd like to get started with. If you're only using GitHub with a personal repository, select your own username in the list of organizations. Not yet part of an organization? Learn how to get started and create one in GitHub through clicking on your profile photo in the upper-right corner of any page on github.com. If you need a hand getting started, get in touch with our support team and we will make sure you get set up! Once you've select the organization you'd like to start in, select the repository within that organization you'd like to kick-off with. 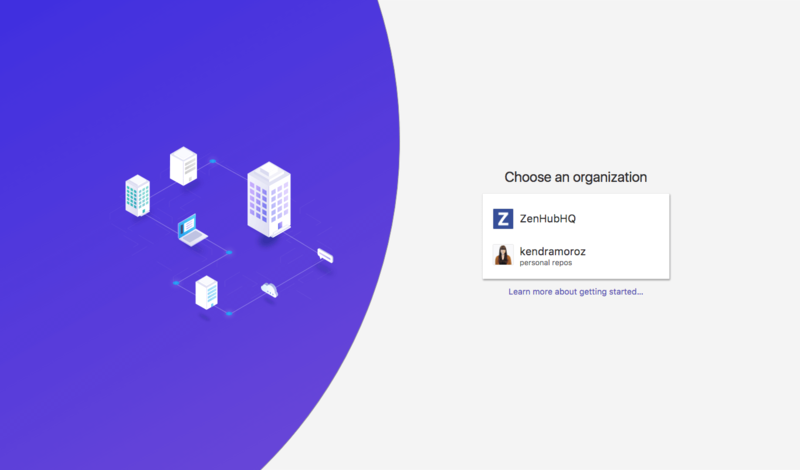 Unsure what repositories are and how they are used in ZenHub? Learn more about repositories, ZenHub, and important agile concepts in our terminology guide here. If you're just getting started, best practice is to select the repository where you're taking majority of your work. 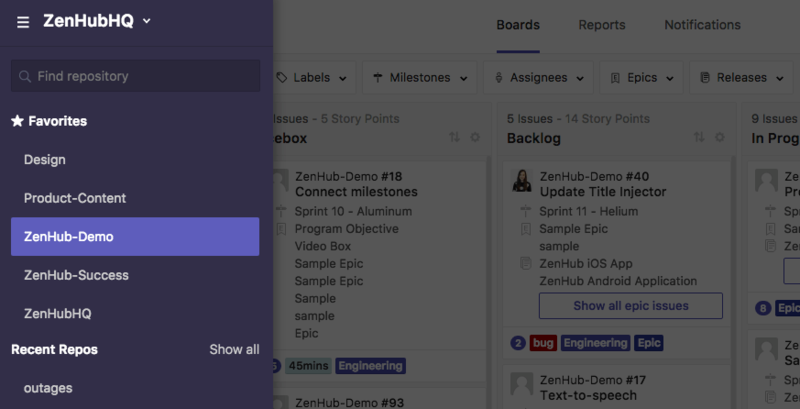 Using ZenHub, you can connect repositories together – even across GitHub organizations – to get a bird's eye view into everything going on across all your team's workspaces. With advanced filters, you can drill down to see only what you need. Learn more here. Don't yet have any repositories created? Head to github.com and click on the + icon that appears on the top-right corner of any page, then click New Repository. Once you've selected the repository, you're ready to kick things off in the Board! Learn more best practices about ZenHub Boards here. To easily access workspaces you frequent, at the top of every page is an option to favorite the workspace. This will populate the repo's section of the sidebar so you don't have to always search a list of repositories to get to important information. If you no longer need a workspace in the favorites list, re-click the star to un-favorite the space. 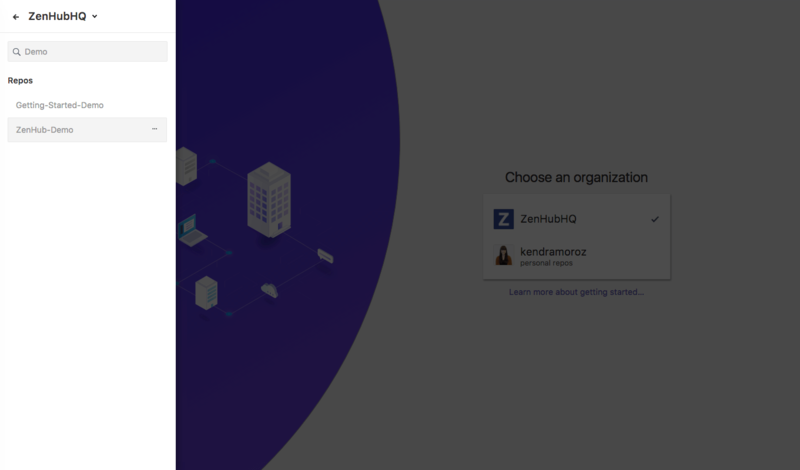 Once you're in the product, the sidebar in ZenHub is activated by clicking on the top-left icon next to your organization name. This will open a list of favorited and recent repositories you've visited within the organization. If you're looking for a repository that isn't listed in this screen, either use the search and begin typing part of the repo's name, or click the see all repositories option. This triggers a complete list of all repositories you have read and write access to within the organization. If you belong to more than 1 organization, or need to access a personal repository you can click on the name of the current organization you're in, or ∨ arrow at the top of the sidebar to toggle between organizations. For every repository, or multi-repo Board in ZenHub, the notifications tab will populate with what you've missed based on the space you're viewing and your personal notification settings. Notifications are managed on a per-Board basis. If you have a multi-repo Board connected, the notifications for all repositories connected within that workspace will be accessible through the notification tab when viewing any of the connected repositories. To change your notification settings, head to Manage notifications on the bottom-left of the sidebar then click on the top-right drop-down to make a change.